Premium Washers are coated 4130 chrome-moly steel-parallel ground, heat-treated and chamfered. Washers are .120'' thick and can be used with both head studs and bolts. Torque accuracy is improved by providing a smooth flat bearing surface. Ensures consistent torque readings. Standard Washers are coated .110'' thick steel. Heat-treated washers reduce the chance of damaging cylinder head bosses and ensure consistent torque readings. 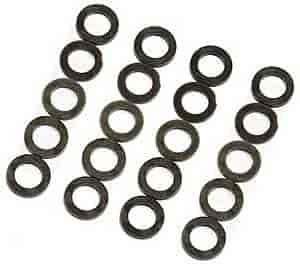 87A - Mr. Gasket Head Bolt Washers is rated 1.0 out of 5 by 1.